Apple has quietly refreshed its Apple Watch microsite with a few changes including more details about the upcoming wearable and newly added interactive images of the device. Previously Apple had a single ‘Features’ page for describing the functionality of the Apple Watch, but has replaced that page with expanded descriptions of the watch’s functions across the separate pages labeled “Timekeeping,” “New Ways to Connect,” and “Health & Fitness.” Each page goes a bit more in-depth into each category with additional details and interactive images. The Timekeeping page also includes an interactive image of the Apple Watch’s stopwatch functionality which allows you to choose between an analog, digital, and hybrid view. The expanded New Ways to Connect page features animations for the Apple Watch’s various communication apps including sketching an image, tapping a vibration pattern, and sharing your heartbeat. Apple previously demoed these functions on stage and described them on the previous version of the site. Finally, Apple has included interactive animations for the Apple Watch’s move, exercise, and stand monitoring functions from its fitness app. 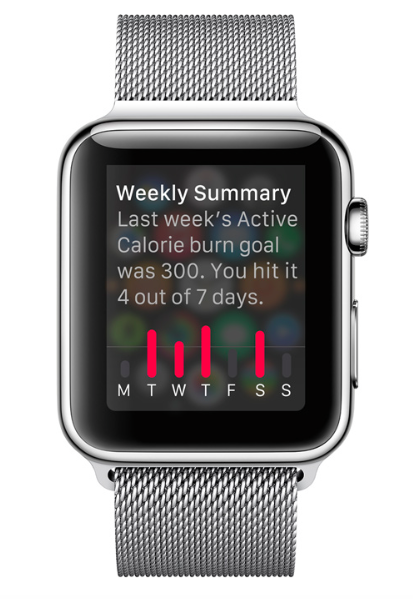 You can also see an animation for the Apple Watch’s achievement feature. Unfortunately, the refreshed microsite doesn’t reveal any details about the Apple Watch’s specific pricing or release date, but 9to5Mac recently reported on Apple SVP Angela Ahrendts’ information shared with Apple Retail that a launch in the spring season is planned offering a bit more light than Apple’s official “early 2015” description. Apple also recently released its WatchKit development tools for developers allowing apps to add functionality intended for Apple Watch in time for its release next year. We described Apple’s WatchKit SDK in-depth here with more details about the Apple Watch.